U.S. House Speaker Paul Ryan said he will not support a resolution to censure President Donald Trump over his comments following the white supremacist march in Virginia, even though he believes Trump "messed up" by saying "both sides" were to blame for violence and that there were "very fine people" among those marching to protect Confederate statues. Ryan was asked at a town hall Monday night organized by CNN in his Wisconsin congressional district whether he would back the resolution that comes following Trump's comments about the Charlottesville, Virginia, rally. The question came from Rabbi Dena Feingold, the sister of former Democratic Sen. Russ Feingold of Wisconsin, who grew up in the same city as Ryan. Ryan said censuring Mr. Trump would be "counterproductive." "If we descend this issue into some partisan hack-fest, into some bickering against each other and demean it down into some political food fight, what good does that do to unify this country?" Ryan said, adding that it would be the "worst thing we could do." While Ryan said he wouldn't support censuring Mr. Trump, he gave his sharpest criticism to date of the president's comments in the wake of the rally where a woman protesting against the white supremacists was killed by a man identified as a neo-Nazi supporter. Ryan had previously spoken out against the violence, both on Twitter and in a statement earlier Monday, but he hadn't previously addressed Mr. Trump's comments directly. "I do believe that he messed up in his comments on Tuesday when it sounded like a moral equivocation or at the very least moral ambiguity when we need extreme moral clarity," Ryan said of Mr. Trump. "You're not a good person if you're there, it's so very clear." The Ryan town hall began 30 minutes later than originally planned to accommodate Mr. Trump's nationwide address where he outlined a new strategy for troops in Afghanistan. Trump vowed to keep American troops fighting in Afghanistan, despite his earlier inclination to withdraw. Ryan said he was "pleased" with what he heard from Mr. Trump and that it represented a more comprehensive strategy than what had been in place under former President Barack Obama. Ryan said he was also glad that Mr. Trump is moving away from having a timetable for withdrawing from Afghanistan and wants to prevent creating a safe haven for terrorists. "We can't afford to allow that to happen again," Ryan said. CNN extended invitations to people from Ryan's district and selected the questions that were asked. That has led to criticism from Democrats who say the Republican Ryan has been hiding from Wisconsin voters since he hasn't held a town hall open to everyone since October 2015. Ryan has held numerous events in Wisconsin, but he's only taken questions from the public in controlled environments such as private businesses. "Hopefully the media event that occurred tonight will convince Paul Ryan that talking to his constituents is a good idea," said U.S. Rep. Mark Pocan, a Democrat representing a south-central Wisconsin congressional district that's next to Ryan's. "In the remaining weeks when Paul is home, he might want to schedule a real town hall or two and explain his health care bill that drops tens of millions of people's coverage, as well as discuss his tax preferences that would give the top 1 percent more tax breaks while working Americans continue to struggle." Dozens of protesters gathered outside the town hall, including Ryan's Democratic opponent Randy Bryce, who said he sought a ticket to attend but was denied. 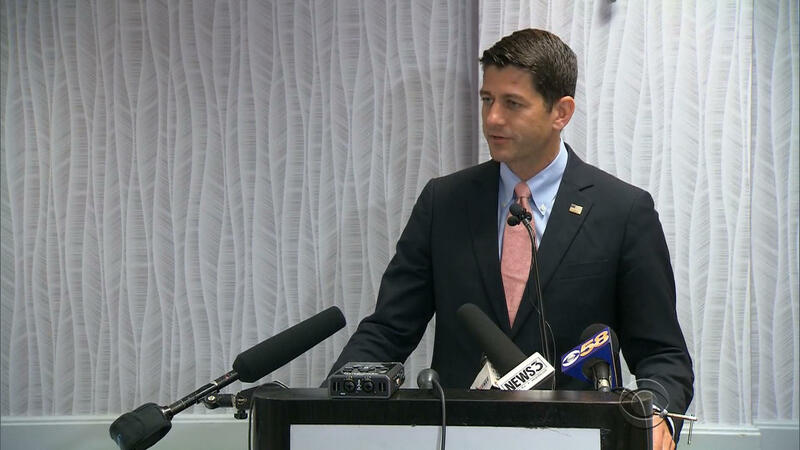 The Ryan town hall event was in Racine, near where global electronics giant Foxconn Technology Group has said it plans to build a factory that could employ thousands. Ryan helped in negotiations with the Taiwanese company and has joined with Mr. Trump and others in touting the news as transformational for Wisconsin's economy. Ryan defended the $3 billion tax incentive package working its way through the Wisconsin Legislature for Foxconn, citing the potential jobs and $10 billion in economic investment by the company, calling it an "exceptional deal."